When we look at an icon, especially a traditional one, we realize that it is not a naturalistic photographic image. Shapes and sizes, including human figures, often seem unnatural. The perspective is not what we are used to. Finally, time also appears distorted, with events and people of different times put together. So an icon is not like a photograph. It is more like a portrait done by a skilled artist who can often bring out depths and nuances that a camera could not catch. This is all true of the Pentecost Icon. Pentecost was an actual historical event. We can read about it in chapter two in the Acts of the Apostles. But the icon gives us new levels of meaning than the text alone does. So for example, Saint Paul is seated among the apostles even though he was not even a Christian on the day of Pentecost. Often the icon will show rays of light descending upon the Apostles from on high. This shows the descent of the Holy Spirit on the Apostle in tongues of fire. Sometimes the Holy Spirit will be depicted in the form of a dove. At the bottom of the icon an old king on a dark background is shown. This is Kosmos. He represents all of fallen humanity because we remember the world until the coming of Christ lay in darkness. In the center of the Apostles there is usually an empty seat. This is the seat of Jesus Christ, who has ascended into heaven but is invisibly present. Finally, sometimes Mary the Mother of Christ is present. In conclusion we can see that this icon depicts the reality of the world, which still lay in darkness to a certain extent, but is being transfigured by God through the church as depicted here. Blessed art Thou O Christ Our God / Thou hast revealed the fishermen as most wise / By sending down upon them the Holy Spirit / Through them Thou didst draw the world into Thy net / O Lover of Man, Glory to Thee! This entry was posted in Church Services, Sermons on May 31, 2015 by gldstrm. Pentecost falls on May 31 this year. On that day the apostles were filled with the Holy Spirit. They were given the power to preach and teach without fear and with joy in the Lord. June 1 is the feast day of another saint who was empowered by the Holy Spirit. Using his considerable intellectual skills, he sought the true God for many years. He finally found Jesus Christ, and became one of the most famous Christian teachers of the early Church. He is Saint Justin the Martyr. Justin was born to pagan parents in about the year 100, in Judea. He had a good early education, but didn’t find it sufficient to answer his questions about the meaning of life. He decided to pursue the study of philosophy, and in his writings he describes his experiences with various teachers. First was a Stoic, who in Justin’s words “knew nothing of God and did not even think knowledge of Him to be necessary.” Next Justin studied with a traveling, or itinerant, philosopher. But this man, he thought, was more interested in collecting his fee than imparting knowledge. Then there was a teacher of Pythagorean philosophy. But he required that a student take his courses in music, astronomy and geometry before concentrating on philosophy. Justin had little interest in or time for such requirements. “A fire was suddenly kindled in my soul. I fell in love with the prophets and these men who had loved Christ; I reflected on all their words and found that this philosophy alone was true and profitable. That is how and why I became a philosopher. And I wish that everyone felt the same way that I do.” Observing the unshakable faith of martyrs strengthened his conviction that Christianity was true. The whole Church of God is adorned with the wisdom of your divine words, O Justin; the world is enlightened by the radiance of your life.By the shedding of your blood, you have received a crown.As you stand before Christ with the angels, pray unceasingly for us all! Saint Justin would later write defences of Christianity (called “Apologies”) powerful enough to convince an emperor to halt the persecutions of believers. He also formed basic Christian thought, being among the first to say that the Old Testament foretells the coming of Jesus Christ as Messiah. 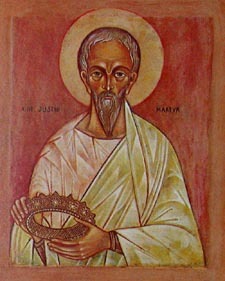 Saint Justin accepted martyrdom, inspired by the example of other martyred believers. The Holy Spirit was at work in all of them, just as on the day of Pentecost when wind and fire changed the apostles’ lives forever. This entry was posted in Education, Sunday to Sunday with DCE on May 31, 2015 by gldstrm. St. Vincent was a monk of the Lerins monastery on the Ile Saint Honorat, in what is now France. He is known for several things. He wrote to proclaim the Orthodox teaching that Mary, Mother of Jesus, should be called Theotokos, or God-bearer, as she was officially called at the Council of Ephesus in 431. He also defended the Orthodox doctrine of grace and free will, which was being distorted in the Western church. However he is most famous for his Commonitory which explained how we know to distinguish the Orthodox faith from doctrinal errors. He wrote that the Orthodox, catholic faith was what was believed “everywhere, always and by all.” In other words, in the Orthodox Church individuals do not ‘discover’ and teach their own individualistic teaching that they find when reading the bible on their own. On the other hand, in the Orthodox Church there is no infallible bishop or groups of bishops. But we have to realize that this is not an exercise in archaeology. We don’t go back, let’s say to May 1st of 900 AD and take a survey of what every person in the church believed then. We do do this, but this is not the whole story. The Orthodox faith is not static. The fundamentals of Orthodox doctrine do not change over time. However, new questions and new challenges arise in the course of history and they have to be answered and resolved anew based on the unchangeable foundation of doctrines. What St. Vincent is telling us is rather that the Holy Spirit abides in the church and allows the church to always be faithful to the basics of the faith, while at the same time dealing with new issues. No individual, no matter how holy, comes up with doctrine on his own. On the other hand, no bishop or group of bishops can infallibly come up with new doctrines. It is always the living presence of the Holy Spirit in the church which keeps that faith whole and unimpaired. We can say that this was the meaning of St. Vincent’s Commonitory for us today. This entry was posted in Church Services, Sermons on May 25, 2015 by gldstrm. During the week of May 24, the Church commemorates two women who had reason to know about despondency. Saint Theodosia (May 29) is known for courageously approaching and standing with a large group of bound Christian prisoners. She encouraged them and kept them from falling into despondency as their martyrdom became imminent. Her own martyrdom followed, and she faced it with courage and good cheer. 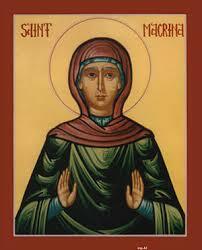 Saint Macrina the Elder (May 30) was the grandmother of Saint Basil the Great. She lived during the persecutions of the emperor Diocletian. To avoid imprisonment and to protect their family from suffering on their behalf because they were prominent Christians, she and her husband Basil “disappeared.” They spent years hiding in a forest, while everything they had owned was confiscated and despoiled. A life so different from the norm, and in isolation from her children and relatives, could easily have led to despondency. Yet Macrina and Basil died peacefully and grateful to God for the blessing of life. 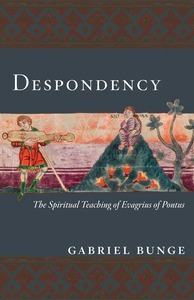 “Despondency: The Spiritual Teaching of Evagrius Ponticus on Acedia” by Gabriel Bunge (St. Vladimir’s Seminary Press, 2013) acknowledges that Christians, like everyone else, and whether lay or monastic, can be tempted by acedia, which the author translates as “despondency.” The book is a collection of, and reflections on the subject in the writings of Evagrius Ponticus, who lived in the fourth century. Everyone, Evagrius notes, is assaulted by harmful thoughts, and their source is always love of self, which may take the forms of gluttony, avarice or vainglory. But even though these thoughts disturb the soul, we can refuse to consent to them. The remedy to self-love is real love, Evagrius writes. That love can be expressed in work, because the devil loves idleness. Prayerful tears, as an expression of one’s hard-heartedness and the need for God’s salvation, are another remedy. So is a brief prayer, said consistently, as a kind of counter-statement to the devil’s promptings. This entry was posted in Education, Sunday to Sunday with DCE on May 24, 2015 by gldstrm. On May 19 we read the Gospel of John 12: 19-36. In these verses Jesus announces, “The hour has come for the Son of Man to be glorified.” He goes on to tell the listening crowd what those words mean. This paradoxical statement is a warning to those who intend to be Jesus’ followers. They must be ready for suffering in this world, and not be so attached to earthly life that they forget or reject the Kingdom they have been given. He calls us to “hate” our life in this world, meaning that we don’t cling to it and concentrate on it as if were the whole of life. If we always remember where wholeness really is, we will have eternal life with Him. 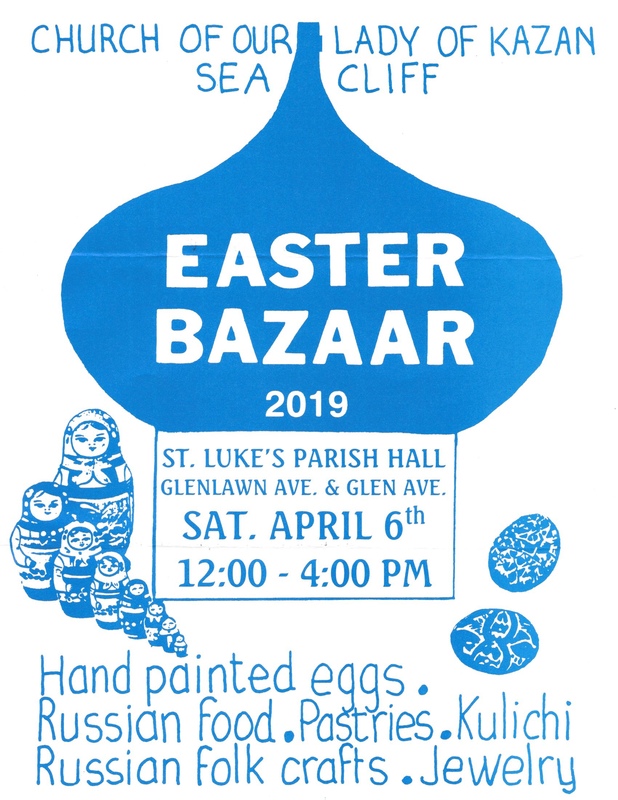 We will be honored by the Father Himself. “…I, when I am lifted up from the earth, will draw all men to myself.” This lifting up from the earth refers to His death on the cross as well as His reunion with the Father in ” the glory which I had with Thee before the world was made” (17: 5). Jesus does not remind them that the Old Testament (“the Law”) prophesies the death of the Christ, the Messiah. He simply urges them to “walk while you have the light, lest the darkness overtake you.” Simple, stark, and urgent words for every one of us to take to heart. This entry was posted in Education, Sunday to Sunday with DCE on May 19, 2015 by gldstrm.